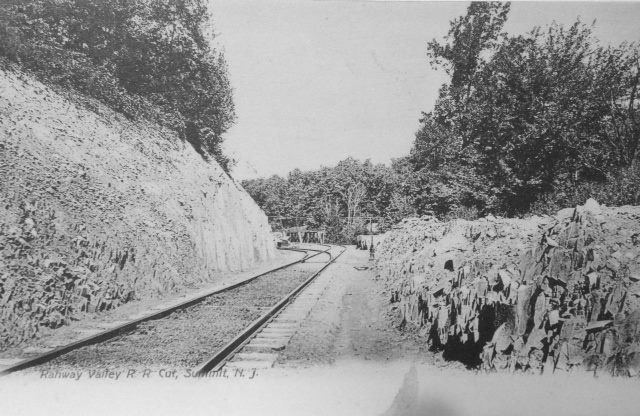 The Rahway Valley Railroad excavated this cut c.1905-1906 for their final approach into Summit proper. The switch, just down the tracks, is for the spur to the Summit Station. The spur curves around the foot of Overlook Mountain to the location of the RVRR's depot. Continuing straight along the mainline, past the switch, will take you to the Broad Street bridge (then called Park Avenue), which can be seen in the distance. This early postcard view predates the connection with the Lackawanna. The tracks that cross Broad Street essentially go nowhere, but they may have served as a siding for the George V. Muchmore coal yard. The piece of track across Broad Street wouldn't become truly active until the Lackawanna connection was made in 1931, some twenty-five years after its construction. Click here to see a film clip of #13 passing this switch connection. In color! circa 1950's. 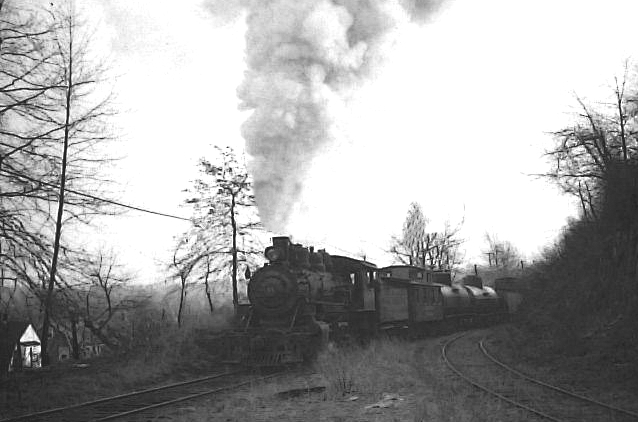 Just before the Rahway Valley Railroad crossed over Broad Street (earlier Park Ave.) (MP 7.02), a Switch Connection (~MP 6.97) was made with the spur track to the Summit Station which was located along the base of Overlook Mountian. This switch connection was located in a cut alongside the mountain. #15, with Caboose 102 in tow, works hard to bring her cut of cars up to the Lackawanna interchange. There's a lot of stack talk going on as the engine makes its final approach to the Broad Street bridge and the DL&W. The track curving off to the right, along the mountain, heads to the Summit Station.